Honorary Membership of the BSB is not given lightly, the recipient having to have given outstanding service. 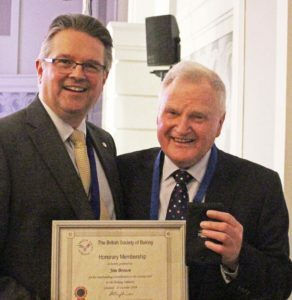 Until the 2018 Autumn conference our only current Honorary Member was Jean Grieves. Over the years Jean gave many superb presentations at BSB conferences. From 1996 she did sterling service on the Executive Committee and as Conference Chairman and was BSB Chairman in 1997/98. Her final conference as Conference Chairman was the Golden Jubilee conference in 2006, which was a tremendous success. The BSB Executive committee felt that the following members merited the honour of joining Jean as Honorary Members of the British Society of Baking. David Roberts joined the BSB in 1971 and contributed greatly to the advancement of the Society in the 1970s and 80s from his work on various committees and as BSB Chairman in 1981 – 82. He also contributed to the success of the Golden Jubilee conference in 2006 as a key speaker at the conference dinner. David continues to support our conferences to this day and embodies everything that is good about being a member of the BSB. 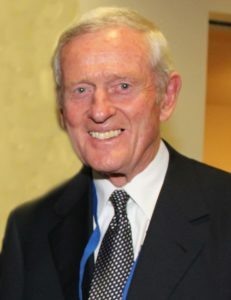 Jim Brown Joined the BSB in 1974 and over the next 20 years served on and was Chairman of, various committees, and was Publication Secretary for 13 years. He was BSB Chairman in 1988 – 89. Having cut back on his BSB work from 1994, he agreed to become BSB Treasurer in 2007, due sadly to the terminal illness with cancer of the then Treasurer Mike Byrd, who is sorely missed. From his previous BSB experience, Jim soon became active in other areas of the BSB, becoming conference coordinator, editor of the conference proceedings, updater of the BSB website and conference photographer. Neil Jackson joined the BSB in 1997 and became a member of the Executive Committee in 2000. 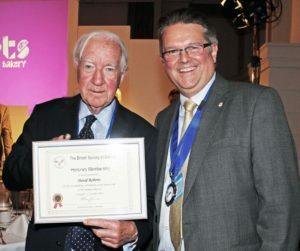 He was BSB Chairman from 2004 – 2006, including the 50th anniversary Golden Jubilee Conference, which he organised exceptionally well with the Conference Chairman Jean Grieves and the then Executive Committee. It was a memorable occasion for all who attended. Neil has supported our conferences, the Executive committee and our activities over many years. He only stepped down from the Executive committee 4 years ago but still attends BSB conferences. Neil celebrated his 80th birthday this year but unfortunately he could not attend the autumn conference due to an important hospital appointment. Welcome to the latest Autumn BSB Conference update as we continue to highlight speakers and their topics. This week, we look at the hugely important topic of bakery education with two award-winning students at the heart of it – make no mistake, this presentation will be enlivening. No room for snowflakes here. These girls graft! This will be a joint presentation from two 2017/18 Baking Industry Awards champions in the Rising Star category, Jessica Dalton and Megan Roberts. What do students learn about bakery these days? Does it fit with trade requirements? With industry needs? How might delegates like to see bakery education changed? And what do students themselves want to change? Jessica and Megan will talk about their own experiences but will not hold back from confronting issues and suggesting solutions so that the baking industry can further attract and support keen students. Speaker bio: Jessica Dalton is a Level 5 Degree Bakery Apprentice at UCB and helps run the confectionery and chocolate departments while training Level 3 Apprentices. She is studying for her BSc Bakery and Patisserie Technology Degree part time too and also works part time in a small craft bakery to enhance her skills and gain more experience. This is a voluntary job. Since winning the Rondo-sponsored BIA Rising Star Award she has been to their headquarters in Switzerland, won further competitions and helped on the ABST committee. Speaker bio: Megan Roberts is currently doing an internship at Zeelandia where she has visited other bakeries, attended team meetings and contributed ideas. She is also working on her own independent projects and on product development. She has attended Marriages flour millers’ sourdough master class and enjoyed work experience at Bread Ahead bakery. Shortly she’ll be attending a Worshipful Company of Bakers’ course at Bakels Innovation Centre, Bicester. In January, Megan will be a Dawn Foods’ student ambassador while also working as chef de partie for pastry at the Wilderness Restaurant. In addition, she’ll be studying her final year of bakery and patisserie technology at University College Birmingham. Welcome to the third BSB Autumn Conference update. Following on from our futuristic technical speakers Stan Cauvain and Lin Carson, this time we focus on two food-to-go successes, one retail and one foodservice, both with great formulas for growth and success, both ready to give delegates plenty of ideas to match our conference theme: Driving Business Forward. Alexandra (Alex) Martin is Director of Retail Operations at Warrens Bakery in Cornwall, a role she has held for the past five years during which time growth at Warrens has powered ahead, growing by approximately 10% this year, at a time when many shops are standing still. Warrens’ range comprises savouries, breads, sandwiches, sweet baked goods and cakes. With two bakeries in the South West it now has 52 equity stores. Warrens also has 21 franchise outlets across the UK but aims to reach a 2018 target of 40! But why is it so successful? Alex Martin will reveal some very interesting ideas. Speaker bio: Jonathan has been Marketing Director of Greencore’s UK Food to Go Division for six years. Employing around 8,000 colleagues in the UK, Greencore FTG manufactures a wide range of sandwiches, salads and sushi for many of the UK’s leading food to go outlets. Jonathan’s remit extends across consumer insight, strategy, innovation, newness and marketing. Prior to joining Greencore, he worked as a marketing consultant for numerous food retailers and manufacturers, including Northern Foods.